A3 software may seem like something of an oxymoron. After all, the A3 technique gets its name from the size of paper early practitioners used to document the problem-solving methodology. (A European paper size that is roughly equivalent to an American 11-inch by 17-inch tabloid-sized paper.) But we’ve come a long way since the A3 technique was first invented. Now there are software solutions designed to support the A3 process, making it even more useful and resulting in lasting results. It is a subject that comes up quite a bit in our conversations with folks interested in finding the most efficient ways to structure continuous improvement. Here are some of the questions they ask us most often. What is the A3 Technique? Why is the A3 Technique So Popular? Here’s what Womack had to say, “It's a tool that engenders communication and dialogue in a manner that leads to good decisions, where the proposed countermeasures have a better chance of being effective because they are based on facts and data gathered at the place where the work is performed, from the people who perform it." Our clients have found that the combination of getting the right people involved, the simplicity of the approach, and visualization result in a powerful force for positive change. Why Do Organizations Implement A3 Software? Standardization: There is great value in having everyone in the organization following the same A3 process and producing consistent documentation. Cross-functional collaboration: Chances are that the most challenging problems you face are those that involve more than one function within the organization. A3 software promotes collaboration by serving as a single platform that everyone can access regardless of their location or department. Visibility: The ability for all involved team members, managers, and executives to have visibility into what is happening with each A3 project is probably the biggest advantage that software has over a piece of paper. With just a few clicks, everyone who needs it has real-time access to all relevant information. Impact Analysis: Once countermeasures are in place, it is essential to measure the impact of the change on definable business goals like cost savings, additional revenue, customer satisfaction and quality. Capturing Institutional Knowledge: Organizations that are great at continuous improvement are always learning from each problem that they take on. What worked? What didn’t? What other issues did we uncover in the process? 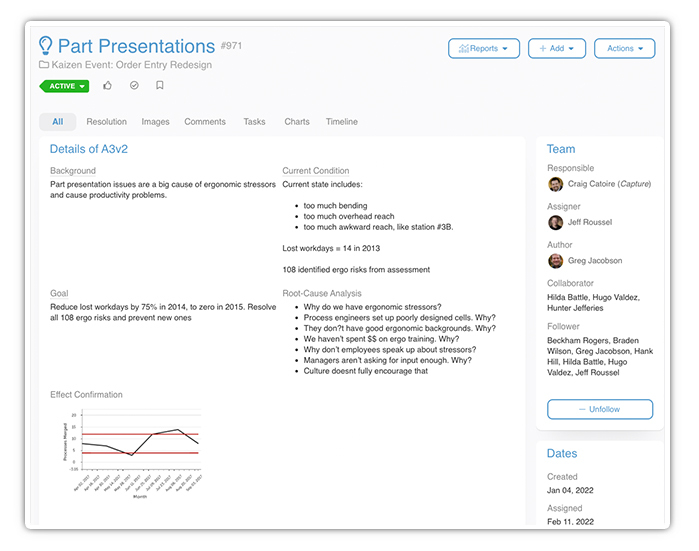 A3 software provides a repository for all of this information so that your team gets smarter with every project. What are the Key Features of A3 Software? Anywhere, anytime availability: It is 2017, your employees should be able to access the platform from wherever they happen to be on whatever device they prefer. Opportunity capture: The best ideas for A3 improvements can come from anyone in the organization. Your A3 solution should make it easy for everyone to report and document every opportunity that they notice. Active alerts and notifications: Here’s what a piece of A3 paper can’t do, remind someone when a task is due or alert a manager that a milestone has been reached. Your A3 software should be able to do this and more by providing a structured workflow for improvement. Visual management: You shouldn’t have to give up the benefits of visual management when you move your A3 problem-solving from paper to the cloud. Look for a solution that retains the “ah-ha” factor that you get when information is presented in a visual format. Whether you are just getting started with the A3 technique or have been doing it on paper for some time, implementing A3 software will help you get better results from each project and make it easier to prove the long-term value of improvement work. If you have questions that we haven’t answered here, please leave a comment, and we’ll be happy to reply.